Charles Darwin University’s student recruitment campaign has won a national award for marketing excellence. CDU and its creative agency, PLAY Communication, won the Australian Marketing Institute’s (AMI) 2011/2012 Best Campaign in the category of Education. The award was made for the “Next Life” campaign. The campaign, which has been running for two years, was developed from extensive market research identifying an opportunity to target mature-age students at a national level. CDU’s Director of Marketing and Planning Anthony Smith said the campaign was targeted at a specific market of busy adults who were looking to education as a means to build a more fulfilling life. CDU is the first organisation from the Northern Territory to win a national AMI award. “It’s been very rewarding to lead a team of marketing professionals as we’ve systematically gone about finding opportunities that have provided CDU with amazing growth at a time when competition for students is red hot,” Mr Smith said. There were eight other finalists in the category of education including the University of Adelaide, Curtin University, the Australian Catholic University and Melbourne Business School. 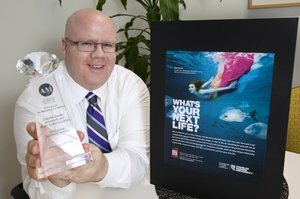 The CDU Next Life Campaign is also a national finalist in the upcoming 2012 ADMA Awards.